"Staying has always been a form of resistance." Aruş Taş, a silversmith in Istanbul’s historic Grand Bazaar, has witnessed decades of economic and social upheaval. But the crackdown wrought by a failed military coup in 2016 has been among the most wrenching, he says. Friends and family are leaving Istanbul, trade has nearly ground to a halt, and his faith that he and his fellow Armenians have a future in Turkey has dwindled. In the wake of the coup, President Recep Tayyip Erdoğan has jailed more than 50,000 people, and the authorities have banned hundreds of news outlets and civil society groups. The country’s lurch toward Islamist-tinged nationalism under Erdoğan has left religious minorities feeling vulnerable. Recent attacks on minorities, although apparently isolated and spontaneous, have heightened those suspicions. Mobs angered by Israeli policies pelted stones at Jewish synagogues in Istanbul last year. Vandals marked the homes of members of the Alevi sect, a heterodox offshoot of Islam, and stoned the empty offices of an Armenian association in the eastern town of Malatya. In September, unidentified assailants threw stones and shouted “Death to Armenians” at churchgoers celebrating a baptism in Istanbul. Erdoğan expanded civil liberties early in his rule, but after 15 years in power has become increasingly authoritarian. He has condemned some of the incidents, but the authorities' failure to prosecute the perpetrators has stirred fear that such attacks could continue. 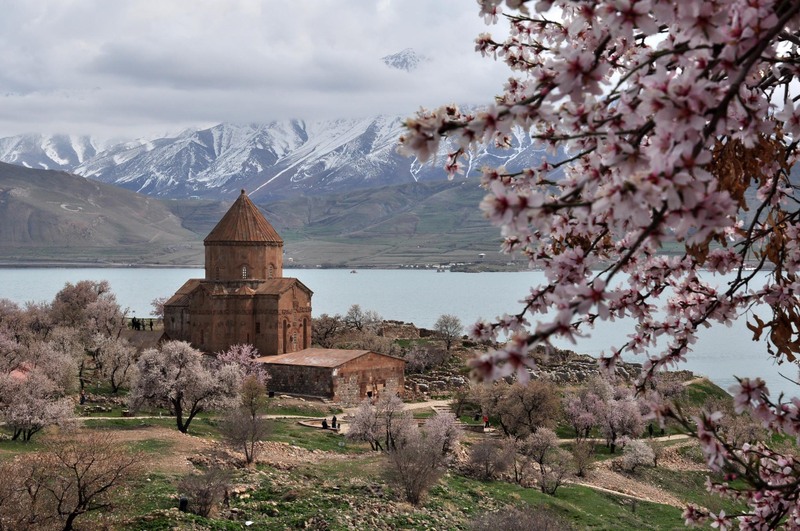 Turkey’s largest group of non-Muslims, Armenians have seen restored churches wrecked in military operations and the government block their efforts to elect a new spiritual leader. At stake is a tentative opening over the last decade that had eroded long-standing taboos, especially about the World War I-era genocide when as many at 1.5 million Armenians perished as the Ottoman Empire collapsed. Armenians “remember their past, what happened to their grandparents in this kind of atmosphere [which encourages] crimes. They know there is a big risk,” says Garo Paylan, an ethnic Armenian lawmaker from the opposition Peoples’ Democratic Party. Turkey still denies the massacres amounted to a state-orchestrated genocide, but Erdoğan in recent years has expressed condolences over the loss of life; public commemorations are allowed to take place; and criminal prosecutions for discussing the genocide have ceased. Minorities in Turkey have benefited from Erdoğan’s embrace of the legacy of the multicultural Ottoman Empire. The secular Turkish Republic that replaced it has, at times, viewed religious and ethnic diversity as a threat to national unity. Turkey’s population of 80 million is officially 99 percent Muslim, but it is also home to some 60,000 Armenians, 17,000 Jews and 3,000 Greeks. Paylan does not believe Erdoğan’s ruling Justice and Development Party (AKP) deliberately targets these groups, but worries rival political forces can “play the card any time, knowing there is bias against the Armenian identity, and organize provocations against minorities. Armenians know that, and that is why they are silent again.” In this environment, many are reminded of the fate of Hrant Dink, Paylan says. Dink was the outspoken editor of the Armenian community newspaper Agos and an advocate for reconciling with the genocide, and was gunned down by Turkish nationalists outside of his office in central Istanbul in 2007. A trial of state officials accused of complicity in the murder drags on in an Istanbul court. Paylan himself faced censure for discussing the genocide in parliament last year. A few months later, parliament passed a new set of rules, dubbed the “Garo Paylan clause,” fining lawmakers who are reprimanded or ejected from the assembly. Paylan sees the rules as an attempt to stifle critical debate. It is part of a cloud of repression that has descended on Turkey since emergency rule was imposed in the wake of the July 2016 coup attempt that failed to topple Erdoğan. Western nations have repeatedly warned that the ongoing state of emergency has eroded human rights, including for religious minorities. A dozen Kurdish lawmakers from Paylan’s party are in prison, as are scores of journalists, academics and rights activists. Osman Kavala, a prominent philanthropist who worked to bolster reconciliation between Turkey and Armenia, which have no diplomatic ties, was jailed in October on coup-related charges. For Taş, the silversmith, the devastation of St. Giragos, the largest Armenian cathedral in the Middle East, was especially bitter. The church was rebuilt in 2011 in the southeastern city of Diyarbakir, and in 2015 the neighborhood was inscribed on UNESCO’s World Heritage List. But just weeks after formally entering the UN register, the neighborhood became a battleground between Kurdish militants and the Turkish military. St. Giragos survived the clashes intact, but remained off-limits after the authorities sealed the district, which is when vandals apparently broke into the church and smashed altars and reliefs. 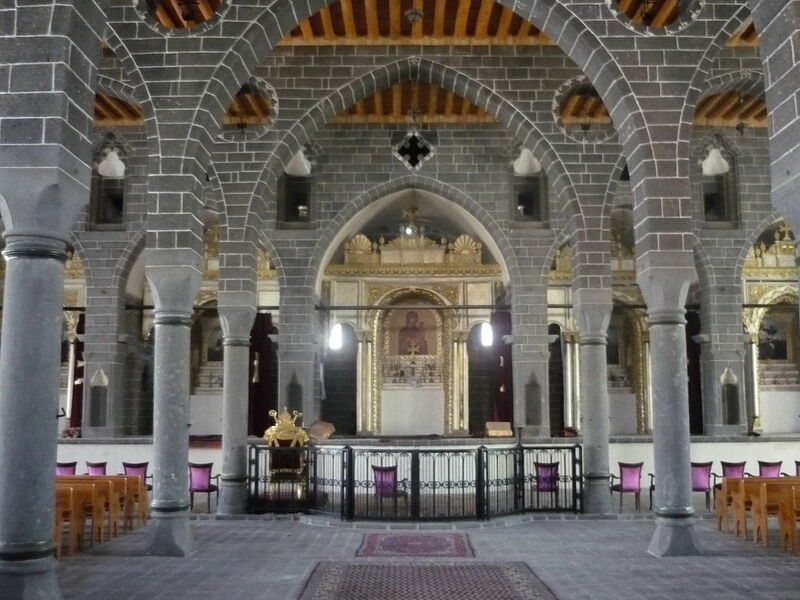 Taş had traveled to Diyarbakir to commemorate the centennial of the genocide in 2015, marveling that Armenians had restored the church to its former glory. “Now, it is hard to see how it can be rebuilt again. Even if it is, it won’t mean the same thing,” he says. Other areas of religious life are also under pressure. The government has thwarted attempts to elect a new patriarch at Istanbul’s Armenian Apostolic Church See. Church leader Mesrob II Mutafyan has been incapacitated, reportedly with dementia, since 2008. A lack of legal clarity over succession and the patriarchate’s status has allowed Turkish authorities to reject the community’s choice last year of Karekin Bekjian, an archbishop in Germany. The Turkish Interior Ministry informed the patriarchate in early February that it does not recognize Bekjian’s position and that the Church had not established the appropriate conditions for a patriarchal election. “Had the election occurred five years ago, perhaps the state would not have intervened as much, but during the state of emergency, when the government is ruling by decree, maybe the AKP wants to choose the patriarch itself,” says Danzikyan, the editor at Agos. The patriarchate, like the Jewish and Greek Orthodox communities, issued a statement last month expressing prayers and support for the Turkish military’s incursion into the Kurdish-held province of Afrin in Syria. “It is an example of the instrumentalization and the use of non-Muslims to speak to the outside world,” says Howard Eissenstat, a Turkey researcher at St. Lawrence University. “In a country where more than 400 people have been arrested for taking anti-war stances on social media, in which non-Muslim populations feel deeply at risk, how could they possibly have said no? “We can't know how they actually feel about the campaign, but there's no question that it reflects a long-term strategy in the republic of non-Muslim communities attempting to demonstrate their patriotic bona fides,” Eissenstat says. For many in Turkey, the climate has become so restrictive that abandoning it has become the only choice. Official figures for the number of Turkish citizens who have moved overseas are not available, but the opposition Republican People’s Party reports that tens of thousands of affluent Turks have left since the coup attempt. Paylan, the MP, estimates that hundreds of Armenians are part of that exodus and that hundreds more plan to go. In recent years, Erdoğan has threatened to “deport” the estimated 30,000 migrants from Armenia in Turkey without papers. The choice of words was painful: Most Ottoman Armenians died during their deportation to the Syrian desert a century ago. Taş, 62, says he is too old and too dedicated to his craft to go. He arrived in Istanbul at age 11 from Turkey’s impoverished southeast, having grown up with tales of the genocide from his father, his family’s sole survivor. A few years after his arrival, a master Armenian silversmith brought Taş to his shop as an apprentice to teach him the trade. “Staying has always been a form of resistance. Almost my entire family, everyone, is overseas, but I never wanted to [leave]. Wherever you go, you are a foreigner,” Taş says. He inherited the workshop when his employer left for Canada after Turkey's 1980 military coup. Taş has crafted silver book bindings for the late Turkmen President Saparmurat “Turkmenbashi” Niyazov’s Ruhnama spiritual autobiography and gold hawk sculptures for his successor, Gurbanguly Berdymukhamedov. His shop embossed meter-high rizas, silver covers for icons, for a church in Greece. A silver replica of an Ottoman mosque he created was given to Erdoğan. Now he estimates that business has declined 90 percent as political tumult drives tourists away from the Grand Bazaar and stalls investment in a slowing economy. 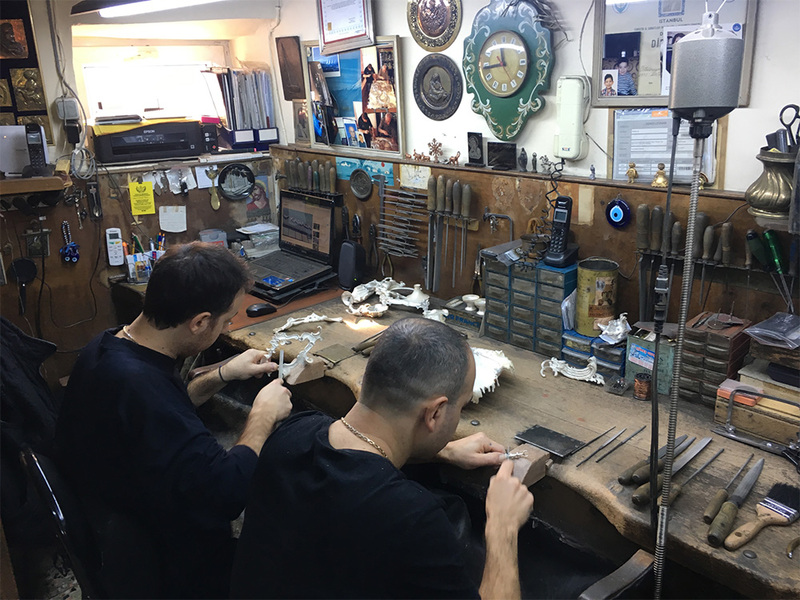 His nephews, both in their 40s, are the youngest silversmiths at the market, with few Armenian youth interested in taking up the painstaking work, he says. “This tradition ends with us. In 10 or 15 years, people will want to buy these works, but there won’t be anyone left to make them,” Taş says.